Tom Pagnozzi tied for 3rd in team batting in 1983, hitting 6 homeruns and 9 doubles for the Erie Cardinals. 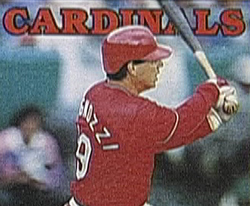 Pagnozzi spent 12 seasons in the big leagues, with his finest season coming in 1996 with St. Louis. Tom hit 13 HR with 55 RBI while batting .270. Pagnozzi's career accomplishments include 927 games played, 44 HR and 320 RBI as a catcher, 3 Gold Gloves, and a 1992 All-Star Game appearance. Pagnozzi retired in 1998 at the age of 36. Tom is currently the President and Chairman of Pagnozzi Charities in Fayetteville, Arkansas.